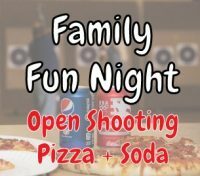 Join us on Friday after Christmas, December 28th from 6 pm – 9 pm for open shooting, pizza, and soda. We will have our range set up with 3D foam targets, balloons for the kids and will have our TechnoHUNT running for open shooting (included in the entry fee). We are looking for this to be a great way to get your whole family out to the range to enjoy a sport together (all shooters must be at least 7 years old (if under 18 youth waiver is required). Rental equipment is included in the entry fee, so don’t worry if you or a family member (or an out of town family member) doesn’t have a bow to shoot. We do have limited spots for these events to ensure there is room on the range for everyone to shoot so you are encouraged to purchase your spot in advance with the link below.